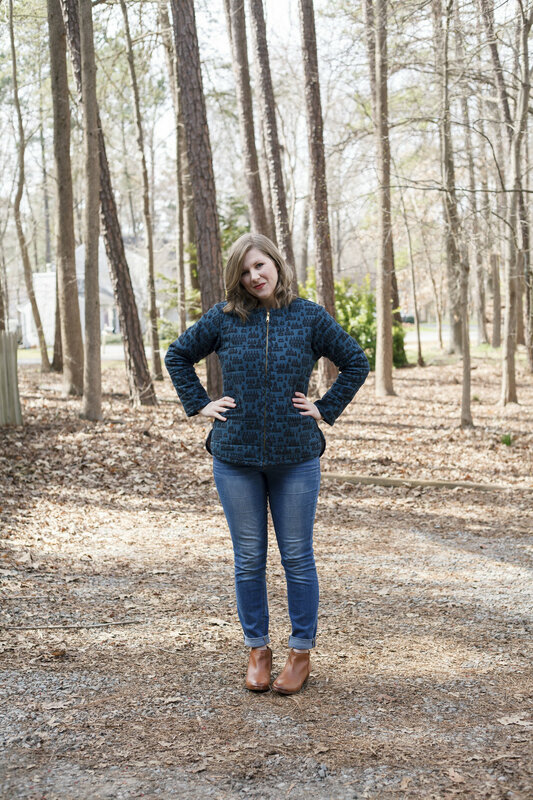 I used Village in Blue for the outside of my Tamarack jacket. I love that although its a busy print it reads as more of a neutral due to the subdued palette. It is a perfect basic that isn't too basic, you know what I mean? I tend toward simple classic silhouettes, but elevating it with a fun fabric that still coordinates with my wardrobe is a home run. I used Pink Lines for the interior fabric. It's such a fun contrast and definitely gives the jacket some personality! Cotton and linen both get better with wear, so I'm excited to see how this jacket wears through next year and beyond. 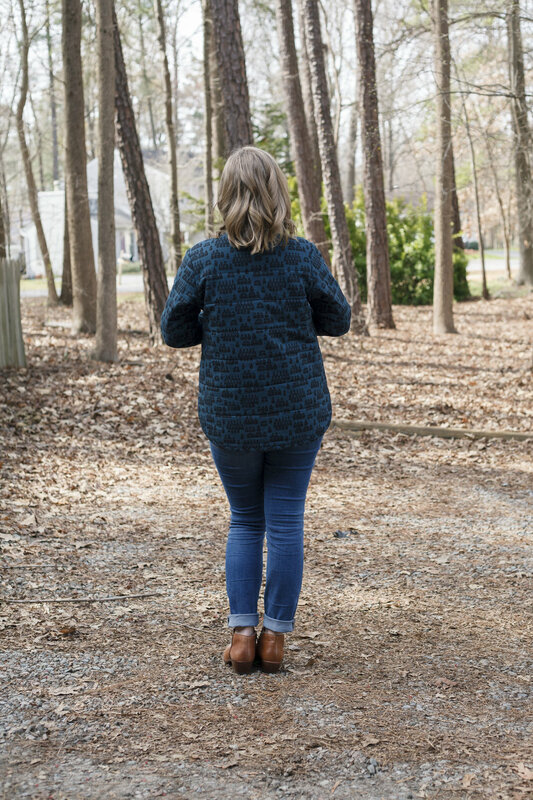 The Tamarack Jacket is a simple quilted jacket with welt pockets, curved hem, and bound edges. If you've made the Blue Ridge Dress, you shouldn't be surprised to hear that I LOVE BIAS BINDING. I enjoy doing it and I love the way it looks! Its a totally underrated finish in my book. 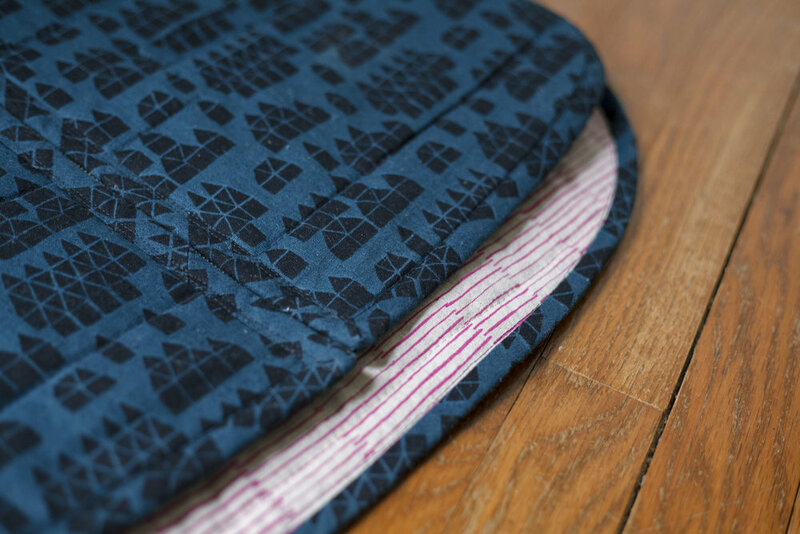 Since each piece of the Tamarack is quilted before assembling the jacket it gives lots of opportunity for bias binding- and I took every chance I could! I bound all interior seams aside from the sleeves where it added too much bulk. Even the pockets are bias bound. Because if I have to sew slow (because I have three kids and my sewing time is limited) I may as well take my time with finishes so I can really be satisfied with what I make. -Blended from size 4 to 6. My measurements put me in the size 8/10 range, but after making a muslin I found it to be too big so I checked the finished measurement chart and chose my size from there. My narrow shoulders and ribcage frequently require a smaller size than my bust says I should choose, and since there was plenty of ease still I chose a size 4 blended to 6. This jacket is already getting lots of wear! Our temperate virginia winters mean I'm regularly switching between a heavy coat and this lighter weight one- you know, until our end-of-february seventy degree weather hit. It has just enough structure to hide the fact that I'm not wearing a bra for school drop-off most mornings, so in that regard this jacket is the savior of my mornings! What do you think, is this a style you would wear?